A 30 x 30cm 2019 official square wall calendar from The Muppets. The Muppets. Der Kalender ist neu, und in Folie eingeschweißt. A 30 x 30cm 2019 official square wall calendar from Guardians Of The Galaxy. Guardians Of The Galaxy. A 30 x 30cm 2019 official square wall calendar from Wreck-It Ralph featuring Ralph breaks the internet. Wreck-It Ralph. Official Kalender 1997. Vielen Dank für Ihr Verstandnis. Der Kalender ist neu, und in Folie eingeschweißt. John Travolta. Der Kalender ist neu, und in Folie eingeschweißt. Kevin Costner. Official Kalender 1998. Vielen Dank für Ihr Verstandnis. (See photos). Tales from the Crypt intro - YouTube. Unique collectible for serious fans of the horror TV series. YOU ARE LOOKING AT AN ULTRA ULTRA RARE 1964-1965 MGM STUDIOS 40TH ANNIVERSARY PROMO CALENDAR. THERE ARE NO SIGNS OF THIS EVERY HAVING BEEN HUNG UP. THE CALENDAR RUNS FROM SEPTEMBER OF 1964 TO AUGUST OF 1965. 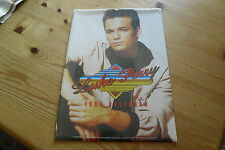 Official Kalender 1995. Kim Basinger. A 2019 wall calendar official (a4 planner) from Tinker Bell featuring Disney Tinkerbell. Tinker Bell. A 30 x 30cm 2019 official square wall calendar from Spiderman featuring mask. Width: 30.0cm (12"). Hunky film star Gerard Butler will be a welcome addition to any home in 2019 with this gorgeous A3 calendar! Famous for films such as '300' and 'The Ugly Truth' fans can enjoy their favourite Scotsman all year long! The 12 month calendar is intact with no pen or pencil markings. It does have wear and mildew spots, but is is 65 years old. Its the real thing not a modern "Lookalike". These are 2 of only a few Calendars published featuring the scandalous TRACI LORDS. Her 1992 Calendar & the much harder to find 1991 Calendar. Both are in excellent, unused condition. Official Kalender 1994. Elvis Presley. Movie Star Calendar for 1950. Published by Motion Picture Magazine. A 30 x 30cm 2019 official square wall calendar from The Dark Crystal. The Dark Crystal. HEROES Collectible 16-Month Calendar (2008). This collectible item from the popular seriesHEROES isNEW andSealed. Kalender in der Grösse / size 30x30cm. FÜR DAS JAHR 2007; Auf dem Photo sieht man die Vorderseite als auch die Rückseite mit allen 12 Bildern des Kalenders.
" Flechsig Film Kalender 1961 ". (von Walter Flechsig Verlag München). der Kalender ist komplett, nichts ausgetrennt. kompletter Filmkalender. Horst Buchholz. das Papier etwas gewellt, sonst guter Zustand. Neues AngebotAMAZING OLD STORE STOCK FIND:SEALED "CLASSIC BOND 2000" CALENDAR - SHIPS FREE! Calendar has never been opened and still contains shrink wrap. An officially licensed wall calendar supplied with a sheet of 70 multi-colour self adhesive dot stickers to mark important and special events. Spiral bound calendar Size 42 x 29.5 cm (A3) Inludes dot stickers Makes an ideal gift The calendar is supplied ready to hang and includes a sheet of 8mm dot stickers, 14 each in red, green, blue, yellow and white. Official Kalender 1996. Pierce Brosnan. This international Movie Posters Wall Calendar is a perfect gift for lovers of film and art or those interested in movie posters of the past. The Calendar is slightly worn and creased but in very Good condition considering it is. JOHN WAYNE / MAUREEN O'HARA - FILM STARS - LIMITED EDITION UK CALENDAR -DATED - 2014. FOR THE FILM " THE QUIET MAN ". PICTURES ARE IN BLACK AND WHITE ONLY. THE BACK COVER SHOWN ABOVE INDICATES THE PICTURE USED FOR EACH MONTH. (See photos). Jurassic Park Trailer - YouTube. Unique collectible for serious fans of the films. And the struggle for the Iron Throne has begun. It will stretch from the south - where heat breeds plots, lusts, and intrigues - to the vast and savage eastern lands and all the way to the frozen north, where an 800-foot wall of ice protects the kingdom from the dark forces that lie beyond. From the creative minds of legendary puppeteer Jim Henson and visionary director Frank Oz, The Dark Crystal is a classic film loved by generations of theatre goers. 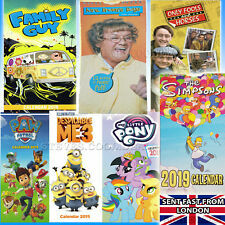 This 2019 calendar features many of the most loved characters from the film whilst providing you with spacious grids. BRUCE LEE, A LEGEND 1975 CALENDAR - RARE!! 1996 Marilyn Monroe 16 Month Calendar - Sealed 12" x 12"